From east to west and modern to rustic, homify 360° is your one-stop source for architectural beauties worldwide. And today we take a peek at a way of living that is decidedly more unique than most of us are used to. Floating Habitats T/A Aquashell are pioneers when it comes to ecological floating residences, not just in terms of designing and building, but also selling. But their portfolio doesn’t just cover floating homes: restaurants, hotels and resorts are also included in their line of work, bringing forth an entire division of floating spaces that offer up exceptional spaces (as they say, location is everything). 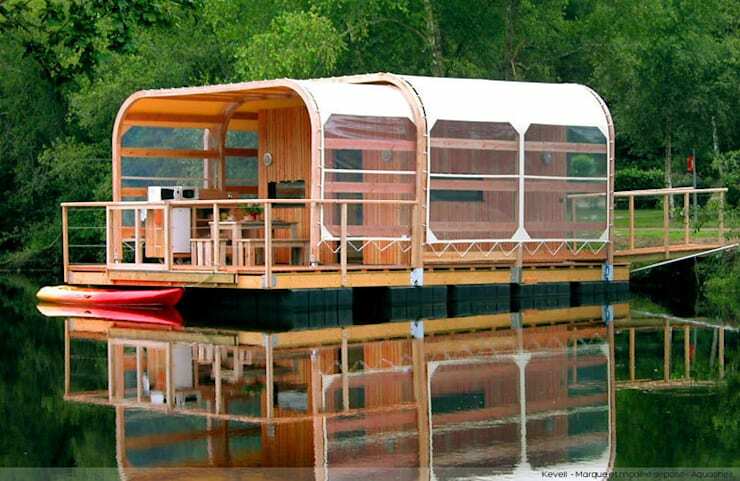 Let’s take a look at this floating way of living. 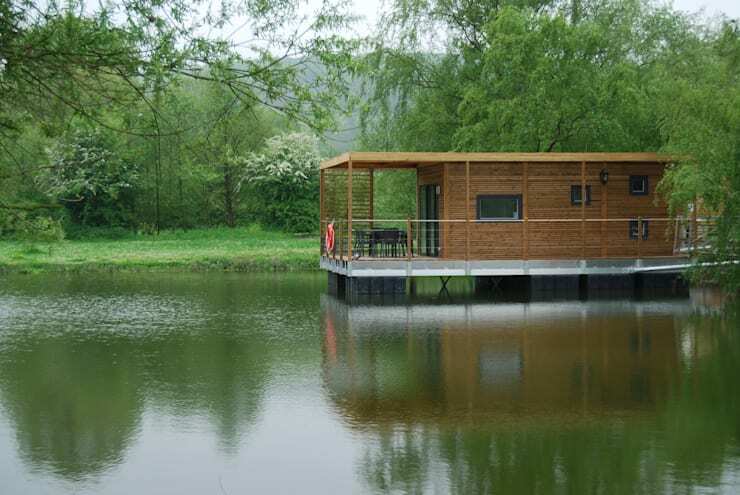 A permanent water view is now possible thanks to Aquashell, who provide the ideal solution for those who require a body of water to watch their worries and troubles float away. Renowned for their innovative work on both water and land, the company is pro at providing businesses and homeowners with the possibility to change up their existing lifestyle in an ecological fashion. 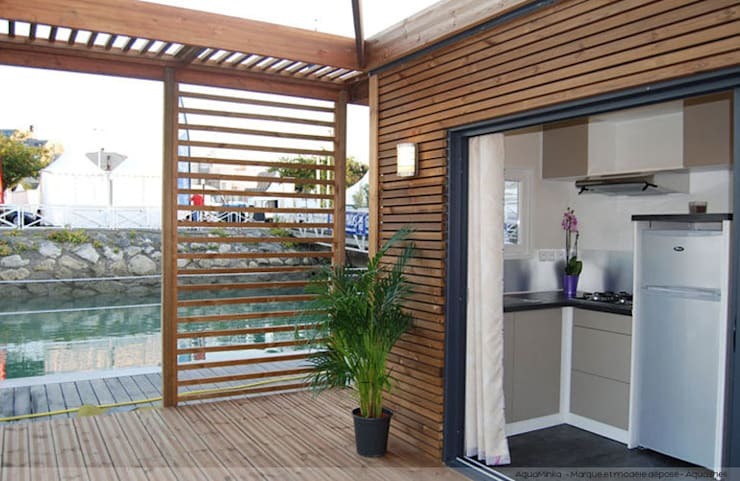 This model can hold up to five people and boasts an interior space that is no less than 24 square metres. It comes complete with a main bedroom (for the parents), children’s room that contains two bunk beds, as well as a third sleeping option that neatly folds away – perfect for the aqua-loving family! For the floating cook, the indoor kitchen is complemented by a grill unit located conveniently outside, sheltered from the elements. The house’s framework is made of a striking timber that is guided on wheels. It can cover or uncover the outer third of the residence’s length, allowing the family to make the most of their terrace when the weather is warm and friendly. A taut netting or pinion-mounted glass cover can also be incorporated. We love a warm and comfy kitchen as much as anybody, which is why we want to show you: 7 ways to furnish a functional kitchen. What could be better than enjoying a peaceful night’s sleep (or even a quick afternoon nap) on a snug and cushy bed while feeling the gentle rhythm of water around you? This ecological floating house presents a stylish interior that consists of neutral tones, strong materials, and clever layouts. Whether it’s on water or land, homify boasts a fantastic collection of bedrooms, available in every style and colour imaginable. For the larger families who love to tread water together, the AquaLivio is the ideal model. 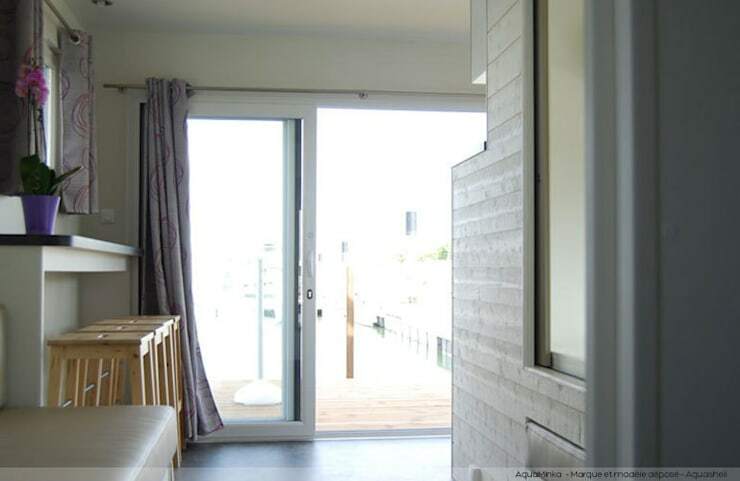 It is the floating home par excellence, providing space for no less than six people. At 12 metres long, it is the ideal comfort space for those holidays by the sea (or river, or dam, or lagoon… ). Wood was chosen for the houses as it is a warm material that is quite resistant to wet environments. Aluminium was opted for the floating platforms, while Polyethylene (high density) provides optimum float use and resistance. But what about the extended family that loves to vacation together? Or for when we feel like “the more, the merrier”, and want to invite all the friends along? No problem, as the houses can gather together to form floating “neighbourhoods” linked together by pontoons. 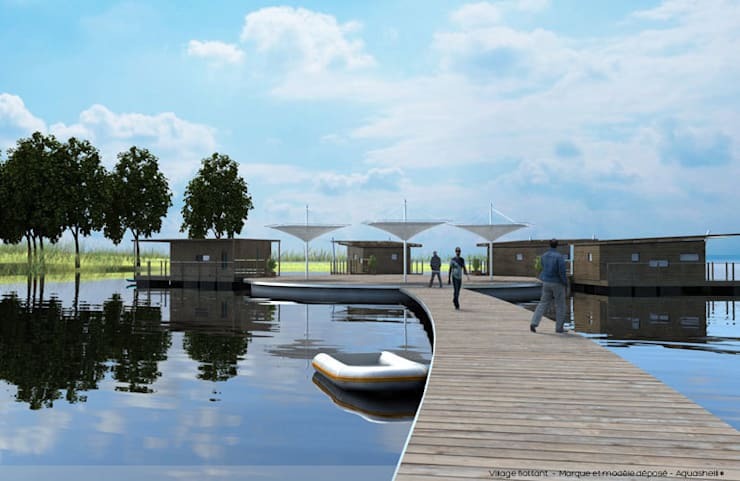 In the same way, these models can be used to construct floating markets, with bars, shops, restaurants, saunas, etc. huddled neatly together to form spaces with optimum views. A floating town? Definitely a unique thought! Whether it’s a holiday break away from the city’s hustle and bustle, or something more permanent, a floating house can be the perfect answer. 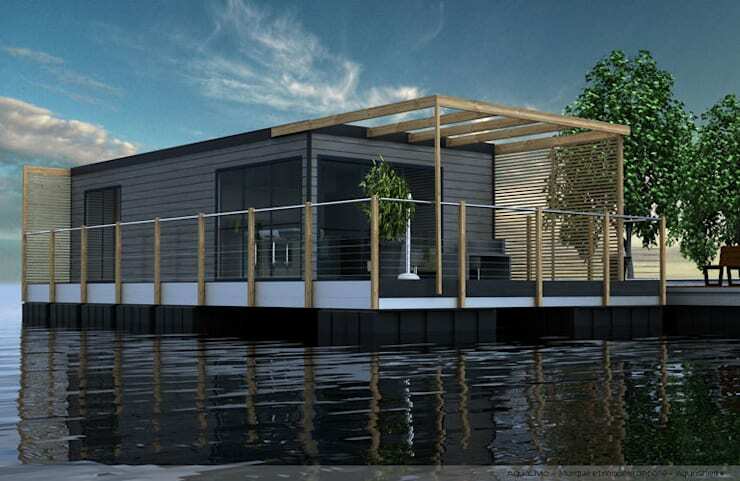 With bedrooms, bathrooms, storage space, adequate seating spaces, and even terraces, the floating house has all the necessary requirements for a comfortable (and stylish) lifestyle. But don’t think that you are restricted to water bodies – all of Aquashell’s floating home models are available in land-based versions. So, don’t be scared to take on that wetland area, or a landscape at risk from flooding. Certain models are perfectly customisable and can easily be transformed from land-based to water-based. The perfect house, or not your style at all? What do you think of the floating house?